Meeting in Salt Lake City, the Constitution Party Presidential Nominating Convention selected Memphis area lawyer Darrell Castle to serve as the party’s 2016 Presidential Nominee. In terms of record, philosophy, stances, and character, Darrell Castle is probably the best individual running for president in this race." 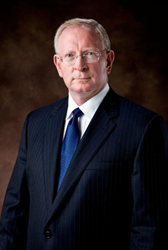 Meeting in Salt Lake City, the Constitution Party Presidential Nominating Convention selected Memphis area lawyer Darrell Castle to serve as the party’s 2016 Presidential Nominee. Though several candidates had been actively campaigning for the nomination, Mr. Castle was drafted from the floor of the convention and won with 184 delegate votes. He has been both a state and national Constitution Party leader since its founding in 1992, including serving as the 2008 Vice-Presidential Nominee in Chuck Baldwin’s presidential run. He is also the creator of the internationally-known Castle Report podcast. Remso W. Martinez, of LibertyConservatives.com, had this to say about Darrell Castle, “Castle is more liberty minded than most of the Libertarian Party candidates, and more conservative by miles than Donald Trump. Castle is the only candidate running that takes his talking points from the Founders and his directions from the Constitution. In terms of record, philosophy, stances, and character, Darrell Castle is probably the best individual running for president in this race." More biographical information and the campaign’s position on the issues can be found at Castle2016.com. Both Darrell and Scott are available for interviews.